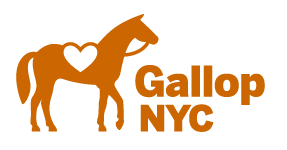 GallopNYC purchased this historic stable, Formerly Lynne's Riding School, in January 2017. The barn and arena are located at 88-03 70th Road, Forest Hills, NY. This is our only exclusively indoor riding location. Take the E, F. M or R subway train to 71st Ave/Forest Hills. There is plenty of street parking available. Bronx Equestrian Center is a full service equestrian facility located in Pelham Bay Park at 9 Shore Road, Bronx, NY. Access this facility by taking the 6 train to Pelham Bay Park and the Bx29. There is parking available. Bowling Green, Prospect Park, located on the corner of Caton Avenue and Coney Island Avenue in Brooklyn, is our exclusively outdoor riding location, weather permitting. It is located inside Prospect Park, just behind the Parade Ground Bowling Green Cottage. Take the F or G subway train to Fort Hamilton Parkway or the B or Q to Church Avenue. There is limited street parking available. Sunrise Stables, Lindenwood, Queens is operated under a license from the NYC Parks' department on a beautiful 5 acre site. Pedestrian directions: Take the A train to the 88th Street- Boyd Avenue stop. Turn onto 88th Street heading towards 107th Avenue. Make a left onto Pitkin Avenue and then an immediate right back onto 88th Street. Make a left onto Arion Road. Arion Road turns right and becomes Pedestrian Opas. Take the pedestrian path across and continue ahead to 149th Avenue. The pedestrian entrance to GallopNYC is on the right, at the end of the fence, just before the start of the homes. Simply open the gate and come in. Driving directions: In order to drive into the property, you’ll have to be going East on Linden Blvd (towards Conduit Blvd). After you pass the Lindenwood Diner on your right, and a big shopping center on your left, just after the 79th St intersection, you’ll begin to see white fence on your right. The entrance to GallopNYC Lindenwood is on your right, just before the intersection of Linden and Conduit. Come through the gate, park on the west side of the property, and come down to the barn.